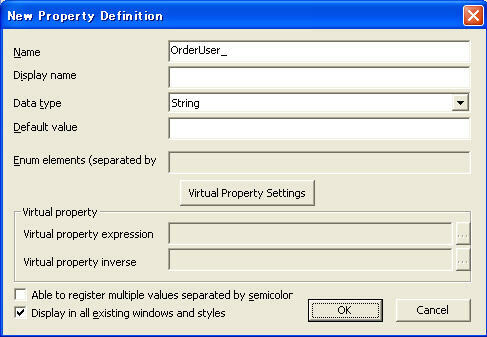 The "New Property Definition dialog" is used for specifying a newly added property. Name of the property used for expressions and so on. You need to specify a unique name. Name to be displayed in the properties window and so on. You cannot use single or double quotation marks in display names. Select the type of the property you are going to add. When you select "Enum" for data type, you have following options..
An enum value may be added or deleted if it is a user-added property. * When you delete an enum value, please make sure to correct the data so that the enum value subjected to deletion is replaced with another enum value and won't be used further. Specify the virtual property expression. For more details, please Click here. Specify the virtual property inverse expression. For more details, please Click here. If you check this box, you will be able to specify multiple values by separating them with semicolons. If you check this box, the property you added will be displayed in all existing windows and styles.